The action in this season’s third round of the Trophyland Cup came to a conclusion on Sunday as Division Four’s Monkhams travelled to Walthamstow to take on Division Three’s E4 Rangers, seeking to cause a cup upset. E4 however avoided a slip up in a 5-1 victory with their goals arriving through Billy Bradley, Ashley Mills, Stuart Griffiths, Mitchell-Christopher Edmonds and George Noonan, securing a slot in the quarter finals. The Division One Cup got underway at the weekend with two sides involved in first round action as Wanstead Albion made the trip to Aveley to take on league leaders in the form of SL Menfica. Despite their recent form, Albion went down 5-0 as David Hornsby netted a hat-trick for Menfica with Charlie Parish and Richard Beard goals completing the win. As matches go, you’d go a long way to match the excitement in the weekend’s Division Two Cup first round clash as two of the most in-form sides in the league met in Beckton with Royal Albert taking on Ferns Seniors. The sides battled away to finish level at 3-3 at full time but the drama wasn’t yet over with another five goals conjured up in extra time as Albert eventually prevailed 6-5. Liam Coney will be cursing his luck as he netted all five goals for Ferns but his amazing efforts proved just in vain. 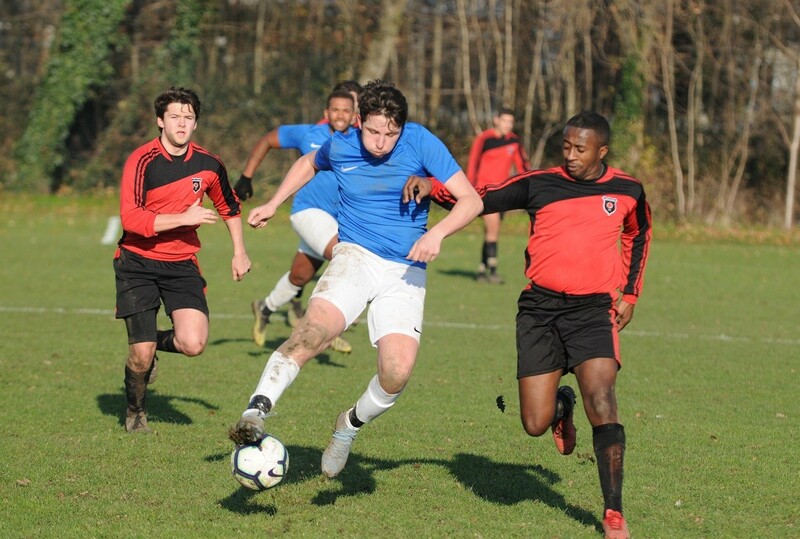 There were two ties in the day’s Division Four Cup with first round action taking place down at Wanstead Flats between title chasing Woodford and AC Milano Reserves. In a topsy-turvy game, Jake Silk scored twice for Woodford. But AC Milano fought back against the odds to level and then win it 3-2, edging a terrific contest to book their place in the last eight. Joining them in the quarter finals of the competition will be Alliance United who put their league struggles aside to beat Custom House Community in another nail-biting thriller of a contest. The sides had finished level at the end of extra time at 2-2 with Harry Smith and Jack Boggis getting the goals for United. Alliance held their nerve in the shootout to win it 4-2 and go through. Back into domestic league action, Romford Elite have closed the gap at the top of the table on the league leaders to six points as they secured three vital points in their away trip to face Warren United in Barkingside. A goal apiece from Thomas Quinn, Jourdon Sabaroche and Joshua Thompson earned Elite a 3-0 win to put a dent in United’s hopes of retaining their crown. Over in Newbury Park, El Valiente kept their hopes of a top two finish alive as they beat an improving Brook Athletic side in a 4-2 scoreline to stay third in the table. Sam Edwards scored twice with Aaron Marston and Matthew Ball getting the other for Valiente to render Brook goals from Lee Lashley and Brandon Martin as just consolation. In the battle between the sides placed seventh and eighth in the table, FC Mexico and Ultimate Vision respectively, the teams couldn’t be separated in ninety minutes with them sharing four goals in a 2-2 draw. Dean Hendrickson and Jack O’Neill scored the Mexico goals with Ryan Chapman and Kieran Ryan netting in reply for Vision. In Division One, St Augustines caused a bit of a shock as they took on and beat title chasing Chingford Athletic down in Barkingside. Anton Trice scored for Chingford but Saints goals from Charlie Casey and James Pararajan gave the hosts a 2-1 victory, their seventh league win of the season thus far. There were also points dropped for a title chasing side in Walthamstow as third placed Ridgeway Rovers came up against Valentine United at Douglas Eyre. There was little to separate the two sides with Jonathan Day on target for United but Rovers also got on the scoresheet too to take home a share of the spoils in a 1-1 draw that puts a dent in their title challenge. Korona Redbridge have moved up to fifth place in the table as they recorded a fifth win of the season in beating struggling Westferry Elite in Barkingside. Two goals form Jacek Miedzak plus one each from Artur Hajduk, Dawid Smolarek, Tomasz Cenin and Adam Waclawczyk helped Redbridge to an emphatic 6-0 win on the day. The leaders in Division Two, Dagenham United, have moved four points clear of the pack at the top of the table as they earned a win in the Dagenham derby over Bretons Manor. With a big county cup tie just a week away, they warmed up for that contest with a 4-1 win as Connor Kain, Ricardo Teixeira, Sean Thomas and Ryan Gallagher all netted for their side. Losing some ground at the top were second placed Barking who were held to a quite incredible draw in their match against bottom of the table Goresbrook. Brook came from behind to lead 5-4 only for Barking level it at 5-5 late on as the sides shared ten goals. William Cox and Charlie Barratt both scored twice for Goresbrook and David Webster once with the Barking goals arriving through Michael Kane, Michael O’Brien, Danny Cook and Terry Church. In another high scoring contest, Walthamstow Avenue’s great run of form continued as they took a point off of high-flying FC Kulture Klub. It could have been more as Avenue led through goals from Zachary Leitch, Liam Nicklin and Jordan Brown but Klub rallied and levelled it up from an Oliver Modeste brace and an Adnan Hamdan effort to finish it up at 3-3. Central Colts have moved to within three wins of securing a second successive league title as they continued winning ways with a trip to Ping City Phoenixes on Sunday. Tunde Olagunju certainly knows where the goal is as he grabbed a hat-trick with Kevin Ituko and Joao Massala getting the others in a 5-0 win. The only side with realistic hopes of catching Colts is Thames Ironworks Community who are doing their bit to keep it interesting following an impressive 6-0 home victory against Masterman on Sunday. Paul Scanlan scored a hat-trick with Bradley Williams and Billy Scott goals completing the win that keeps them ten points adrift of the top but with three games in hand. County cup quarter finalists, Hornchurch Oakmont, are a side who might yet have a say on the destination of the title and they warmed up for their big game next week with a hugely important win away at Alpha on Sunday. James Mitchell and Ross Woolward scored the goals for Oak with Kai Brown netting in reply for Alpha in a 2-1 scoreline that sees those sides third and fourth placed respectively. And completing the Division Three action, West Essex picked up another point in their race to avoid relegation as they travelled to Dagenham to face Roneo Colts. Tommy Harber and Chris Pope netted for the hosts but West goals from Connor Brathwaite and Ronan McGoldrick levelled up the contest and see the sides share the points in a 2-2 draw. There is still a long way to go but the odds must be shortening on a Newham Athletic title victory this season and the leaders were at it again as they beat off fourth placed Grey Area in a local derby in Beckton. James Farmer, Chris Jennings and Kane Greene all netted for Newham as they ran out 3-0 winners to open up a three point gap at the top with a game in hand still. Fifth placed Asianos Reserves are a side who could have a say in where the title goes and they upset one of the other challengers on Sunday as they sent third placed East Ham Inter spiralling to a 1-0 defeat. Ali Jalo’s goal for the hosts was all that separated the sides with that win for Asianos keeping them in touch with the business ahead of them. The form shown by Oak Royals either side of the festive period has shown a marked improvement and they must be feeling on top of the world, recording a fourth league win on Sunday with a 4-0 home victory against Epping Forest Falcons. Oak goals from Daniel Gotobed, Mark Levy, Daniel Lister and Ryan Mitchell were too much for Falcons who slip below their opponents as a result. In the weekend’s charity cup action, last season’s finalists in the West Essex Sunday Charity Cup, Barking & Dagenham Wanderers, are one step away from repeating that feat as they were winners in their quarter final at home to former winners, Valiant. Wanderers battled to a 5-2 win to book a trip to either Belfry or JK Silvertown in the semi finals.